The Bay Area has a new player in antibody drug development, backed with some big bucks from the world’s largest maker of antibody drugs. CytomX Therapeutics is announcing today it has raised $30 million in a Series B venture round led by Third Rock Ventures, along with Roche Venture Fund. While CytomX is currently based in Santa Barbara, it plans to move to the Bay Area by the end of this year, to tap into a bigger biotech R&D talent pool as it pushes its new class of antibodies toward clinical trials. The big idea at CytomX is to develop a new class of genetically engineered antibody drugs that have the same ability to hit specific targets on cells, but are designed to produce fewer side effects. 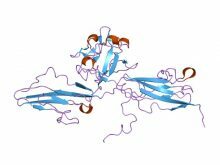 The concept, from the UC Santa Barbara lab of chemical engineering professor Patrick Daugherty, is to combine a peptide with the antibody, so that the drug only gets activated in the presence of certain enzymes (proteases) in diseased cells. This way, the antibody will remain inactive while it circulates in the bloodstream. The company, founded in February 2008, has pushed its most advanced drug candidates only to the animal testing phase, so this concept is a long way from being proven in humans. But the potential is huge, as the antibody drug market generated about $30 billion in worldwide sales in 2009, and is projected to grow 14 percent annually through 2012, according to Datamonitor. “We saw an opportunity to improve on the antibody landscape, improve on some of the liabilities and create what’s really a more targeted, locally active antibody,” says Nancy Stagliano, CytomX’s CEO. Third Rock is now making its second bet on improved antibodies as part of its Bay Area expansion. Along with Pfizer, Third Rock invested earlier this year in San Francisco-based Ablexis for its new mouse model for antibody drug discovery. Roche also has an obvious interest in antibodies. Now that Roche owns 100 percent of South San Francisco-based Genentech, the pioneering developer of antibody drugs like trastuzumab (Herceptin) and bevacizumab (Avastin), it is unrivaled as the world’s largest maker of targeted antibody drugs for cancer. CytomX isn’t saying much yet about what it really has come up with. Two of the company’s peptide/antibody combination drugs are aimed at treating cancer, while others could be designed to treat autoimmune diseases like rheumatoid arthritis, Stagliano says. She wouldn’t disclose the name of the molecular targets those drugs are aimed at, although she did say CytomX’s plan to is go after targets that have already been validated by FDA-approved drugs, before it ventures into the riskier territory of pursuing novel targets. Manufacturing these new molecules shouldn’t be any harder than making existing antibody drugs, which are incubated in living mammalian cells. The peptide and antibody arise from a single gene product, Stagliano says, meaning that there isn’t another complex step required to attach the two proteins, she says. The human stars aligned in an unusual way for CytomX. Stagliano, a neuroscientist by training, spent almost eight years at Cambridge, MA-based Millennium Pharmaceuticals before moving to Santa Barbara for personal reasons, she says. There, she was introduced by Millennium colleagues to Daugherty at UCSB, and a third future founder of CytomX, Frederick Gluck, a former managing partner of McKinsey & Co. CytomX, with this mix of science and business experience, raised about $5 million from angel investors, many of them in the Santa Barbara area, to test whether its concept was worth a shot commercially. “The local community was very good to us,” Stagliano says. Right now, CytomX has eight full-time employees who have played a key role in its early scientific days. It plans to hire another 10 people in the Bay Area as part of the new financing, including a chief scientific officer. Given that the Bay Area is home to a lot of experienced antibody hands from places like Genentech, Abgenix, and PDL Biopharma, it shouldn’t be too hard to find the right people as CytomX seeks to grow.